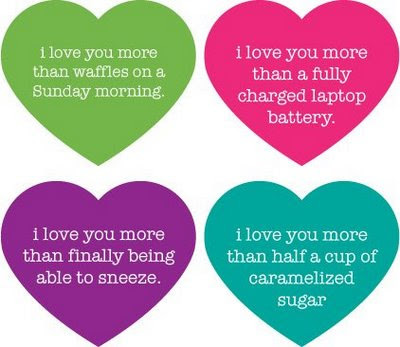 Seeking to bust the Valentine's Day OTT icki-ness factor, I Love You More Than Blank is a cute site where you can tell someone just how much you love them in a heart of your making. As map magazine describes it: As a kid, do you remember measuring how much you loved someone by the width of your open arms? Love was a physical space in between your hands, with your heart in the middle. Do you remember your first love, and counting off the reasons why your heart beat faster at the sound of their name or their voice? Remember plucking flower petals and wishing on dandelions, as they both took your thoughts of love and devotion for a journey on the wind? Using the real things in our everyday lives as a measuring stick for the height and breadth of our feelings, I love you more than blank is a funny, surprising, cute and heartfelt dedication to how much we really love each other. I am far too verbose. Last Birthday Post - I Promise!